Maybe you have you heard of it under the more well-known title, Phenomena? You need to re-read my review! Nah... I knew it was originally titled Phenomena... I mentioned it more then once in my review. We either butcher 'em or remake 'em! I did read it. Honest. Short term memory spasm. How come I'm not surprised? But as I said it was never released theatrically in the States as Phenomena. Just like The Beyond was released cut as Seven Doors of Death or Cannibal Apocalypse who was released cut as Invasion of the Flesh Hunters. When the town of Hemingford discovers the gruesome massacre in neighboring Gatlin, the once quiet Midwestern town is jolted into activity. Tabloid reporter John Garrett, who is hoping to break the story on the bizarre murders, is travel with his defiant 19-year-old son, Danny. While staying in a local bed and breakfast, Danny meets the orphaned Micah. Micah soon becomes the leader of the resurrected corn cult and more adults die horrible, violent deaths. Sensing that Danny is at odds with his father, Micah tries to lure him into joining the cult. 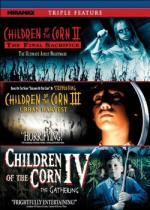 Part of a Children of the Corn triple feature set I bought for this past Halloween marathon... unfortunately I never got around to watching it back in October. I haven't seen this movie since it was originally released... wow, that was 20 years ago!?! So needless to say... watching it today was like watching it again for the first time. At first I was considering watching the first movie before this one... but I seen it not that long ago... and seen it several times... so didn't feel the need. After watching I felt it was pretty good. I didn't care for it as much as I did the first one... but it was still worth watching. Yes... this one does have a bit of blood in it as well... but the first movie was more graphic. Over-all I would say it is worth the hour and a half you put in to watch it. Unfortunately there is no extras what so ever on this release. I really enjoyed Anaconda when I saw it... so was looking forward to this one when I found out a friend was giving me a copy. The first thing I notice is this movie stars Kadee Strickland. I am familiar with her as she is in the main cast of the medical drama Private Practice playing Dr. Charlotte King. I have to say I enjoyed this one over-all. It isn't what I would call a great movie.... but I definitely had fun watching it. I did like the first Anaconda movie better... but this one is also worthy of a place in your collection as well. I loved the first but found this disappointing. I still enjoyed it but mainly because creature features are one of my fave sub-genres. 3 and 4 are hilariously bad. So much so they are enjoyable. I'm just waiting to be able to grab them very cheap. I was given part 3.... haven't watched it yet though. I got worried about it as soon as I saw that the main star was David Hassellhoff. I mean I liked him in Knight Rider.... but that is the only thing I ever saw that I did like him in! I would actually say he is one of the reasons it becomes train wreck fun.